Zero waste and plastic-free living are often spruiked as a way to save money. I avoid using that reason (I explained why I won’t talk about money-saving here). Even though, yes, living zero waste means I spend less. Whilst overall I spend less than I used to, some things I buy do cost more than their packaged equivalents. In the early days, I stood in the aisle, looking at the cheaper pre-packaged item and the more expensive bulk or zero waste one, and felt torn. If someone embraces zero waste living solely as a way to save money, this is the point where they will stop. That’s one reason why I don’t use the ‘money-saving’ reason as a benefit. I want others to embrace this lifestyle beyond the choices that cost the least amount of money. I want others to embrace choices that make the best sense for the bigger picture: local communities, our health, wildlife, workers rights, the environment and the planet as a whole. Oh, I’ve been there! 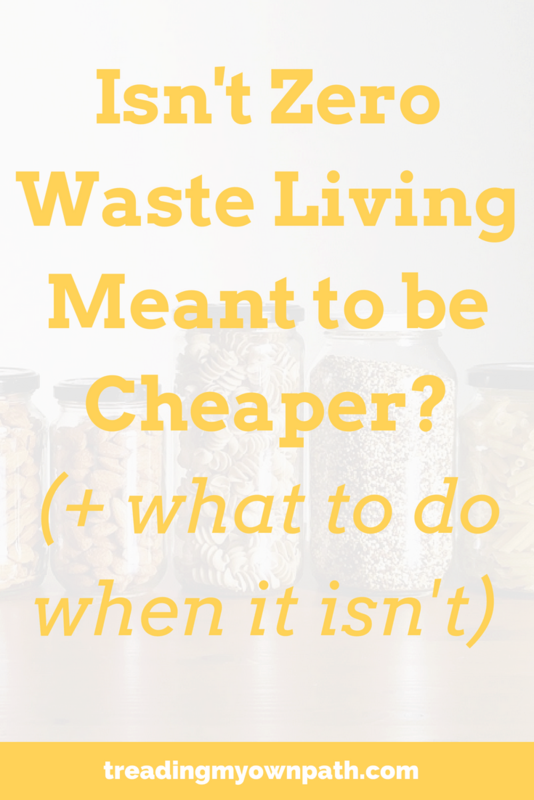 These are my suggestions for what to do when zero waste isn’t the cheapest option, and you feel conflicted. 1. Remember Why You Chose the Zero Waste/Plastic-Free Lifestyle. Most people choose this lifestyle for a number of reasons, and some of these reasons are about more than ourselves. Reasons such as: supporting local businesses and growing local communities, reducing litter, improving the environment, protecting our marine life, limiting harm to wildlife, reducing our impact on the world’s resources. When we make choices that support ideas that are bigger than ourselves, we feel good. If you’re faced with a difficult choice, try to keep your ‘why’ at the front of your mind. It might help you see the choice you’re making in a different light. 2. Ask Yourself What You Value. For me, it comes down to values. I value locally grown, reduced carbon emissions, and organic. I value supporting independent businesses, and eating real food. I value spending my money with companies I believe in. I value ethical and Fair Trade and sustainably produced. I want to see more products that fit in this niche, and more stores that support these ideas. The best thing I can do is vote with my dollar, and choose to support these brands and allow them to grow. Ultimately I don’t want this to be a niche, I want it to be mainstream. Supporting it is the only way this will happen. Which is why, rather than shop at the bulk aisle in my local supermarket, I choose to shop at independent bulk stores. My favourite is The Source Bulk Foods. There’s one in my neighbourhood, but they have 33 stores across Australia (there’s 3 in Perth, and more planned). They aren’t the cheapest option, but they align the most with my values. Importantly, they are passionate about zero waste (some bulk stores here aren’t actually focused on the waste aspect). The Source also have a huge variety of Australian-grown produce: almost all of their nuts are grown in Australia, and they even sell Australian quinoa. Supporting stores that champion these practices is more important to me than saving a couple of dollars. 3. Avoid Comparisons (Ignorance is Bliss). Have you heard the saying ‘comparison is the thief of joy?’ No-one wants to feel ripped off, or like they spent too much. When we know that there’s a cheaper option, sometimes it can be hard to make the right choice. My solution is not to look. I rarely go in the supermarket now. I never look at catalogues or shops online. If I don’t know what I’m ‘missing out’ on, it stops the comparisons, and I’m happier,. I know what I need, so I go to my regular shop, and decide if I want to make the purchase based on the price that day. If you didn’t know that the supermarket was cheaper than your local bulk store, it would change your whole perspective. Where you can, avoid looking. It’s funny how we can get hung up on the price of some things, but not others. When avocados hit $4 in the shops here, everyone goes nuts at the ‘expensive price’ – even though they are locally grown, delicious and very good for us. Yet bumper boxes of super processed biscuits – the ones made entirely or processed sugar, processed flour and trans-fats (or palm oil)? If they are $4 people think it’s a bargain. Rather than stressing that the waste-free version is more expensive than the pre-packaged version, we can re-frame the question. We can ask ourselves: can I afford it? Is there something I could go without in order to buy this? Do I want it that much or could I go without? I buy chocolate, and I buy coffee, and both of these could be considered luxury items. (Even if I like to think of them as essentials!) If something else I really wanted seemed expensive, I could pay the extra and forgo one of these. If you regularly buy takeaway coffee, or take-out, or magazines, could you reduce your spending in this area? These are the choices we can make. There may be things that you just can’t afford to buy zero waste at this point in your journey. Then you have two options: go without; or compromise. 5. Rather Than Worrying About The Price of Individual Items, Set Yourself a Budget For Your Entire Shop. It’s all very lovely to talk about values and priorities, but most of us living a zero waste or plastic-free lifestyle have a budget. Hello, real world! Much as we might want to, we can’t necessarily afford to make all the perfect choices. I’d like to buy everything organic, but in reality, my budget doesn’t allow me to. Rather than stressing over individual items, we can set a budget for our whole shop. Many things in bulk are much cheaper than their pre-packaged counterparts, yet we tend to focus on the stuff that costs more rather than celebrating what costs less. Are things really too expensive, or can we accommodate them by making other changes? Knowing exactly how much we have to spend will help us make better decisions – either now, or in the future as our circumstances change. The answers will be different for everybody. Don’t beat yourself up because you can’t always afford the perfect option (most of us can’t). But if the better choice is only a couple of dollars more, ask yourself what’s really stopping you making that choice? For me, the question isn’t “does it cost more?” The question is, who will benefit if I choose the zero waste, organic, local option? And who will benefit (and who will suffer) if I don’t? When I’m on the fence about making the more ethical choice over the cheaper one, this helps direct me back to my priorities. Now I’d love to hear from you! Do you ever get torn between cheaper options and more ethical, expensive options? How have your choices changed over time? Is there anything that you’re currently struggling with? Do you have any tips to add? Please tell me your thoughts in the comments below! ← How Much Does a Zero Waster Recycle? Lady, I appreciate this post. I’m still a Zero Waste Newbie— strictly because I’m on the fence about issues like this. While I’ve been spending less overall, some price tags still make me cringe, and I still have dozens of habits to undo. Thanks Rebekah! It’s hard to undo years of habits with new ones, so don’t underestimate it. Even when rationally we know the answer – we aren’t always rational. I talked about zero waste and plastic-free, but it also applies to supporting local businesses over big companies like Amazon when making purchases; choosing the most ethical brand/company over the most aesthetically pleasing; and of course, our personal preferences with taste, visual appeal, material, texture etc. That said it is an interesting and rewarding journey! And the more we flex our ethical muscles, the stronger they get and the less fence-sitting we do! I’m in a low income bracket so I just can’t ignore and forget the prices at Aldi’s where the noodles n the milk n bread is 5 times cheaper then the bulk food store. I can’t afford $5 for a pound of noodles when I can get it for $1 . And I can’t afford $5 for a 1/2 gal of milk when I can get it for a $1. I did do it for a couple months but I stopped. And I can’t afford the ingredients to make my own milk neither nor do I have the time. I still don’t have a trash can at my place, I burn cardboard/paper n recycle the glass. The bulk food stores here are a lot different from what your use to. The only cereal product is Cream of Wheat and then from there its coffee n tea and nuts n candy and flour and maybe 2 types of macaroni noodles. I wish they were as nice as the bulk stores I hear about in Canada or in other countries but there not. Tina from Belleville Mi. Tricky on phone. I use s/market s/times, other times buy bulk. Doing both allows me to maintain a reasonable budget, without agonising too much about extra costs. wish source shops took donated empty containers for others to use. Tina try compost or worm farm instead of burning paper, free fertilizer for garden!if you can. What!! Who would throw out a box of jars!? I focus on voting with where I spend my money. I also (mostly) stopped shopping at large supermarkets. My overall spend is less as I don’t end up being tempted by spending money on cookies, lollies, or other items with little or no nutritional value. So, (mostly) plastic free / zero waste has resulted in me eating much healthier, spending less overall, supporting businesses and ethics I would like to see expand, doing my bit to make the planet a bit better, and feeling all warm and fuzzy about aligning my actions with my values. I think it is fantastic that more and more people are making similar decisions on their own. I love this Mel – you sound exactly like me! Removing myself from supermarkets wasn’t deliberate, but happened over time as I found better options elsewhere. Then I realised that yes, I wasn’t buying junk, wasn’t being tempted by “special offers” that were actually things I didn’t need and were costing me money, not saving it. Lyndsay, some great points here, especially what you said about values, perspective, and your reasons why. I agree, zero waste has not always been the cheapest option because I spend more on local meat and produce. However, because it has simplified all aspects of my life, I spend less on other things, meaning that money is available for things I value, like organic food that hasn’t had to travel far to get to my plate. Perspective is a good point, because some would complain about the high price of a bulk vs. packaged product, however, every day they purchase a $5 coffee or go out for lunch or purchase apps or or or or… Enjoyed reading this. Thanks! Hi Nadine, thank you for sharing your thoughts. You have summed up exactly how it has been for me too. When we started we used to spend much less on food, buying fruit and vegetables imported from China and the cheapest nuts and grains, for example. Then we chose to spend more to buy better – local Australian produce (added bonus – it isn’t sprayed for 2 hours with methyl bromide), better quality, fresher bulk goods, more organics. I used to buy cashew pieces because they were cheapest, but when I first tasted a fresh cashew nut it blew my mind. The pieces go rancid much more quickly. So I spend more to buy better. Yes, like you I spend less on other aspects. Honestly, food is one of the only things we buy! Getting hung up on the price of some things is interesting: I used to work with a lady who complained about the price of stamps but was happy to buy new handbags on a regular basis. As animal welfare is so high on my priority list, I always buy organic eggs from the market (and reuse my egg box!) even if they cost more than standard barn eggs. After all, we only talk about maybe a £1 difference at the most. If I had to buy meat, the price difference would be huge and I’m not sure if my budget could take it – and then I’d feel guilty for buying the cheap stuff. (That was one of the reasons I stopped eating meat altogether and I don’t even miss it.) I don’t bulk buy everything yet but try to get my staples and locally-made detergent refills at the market. 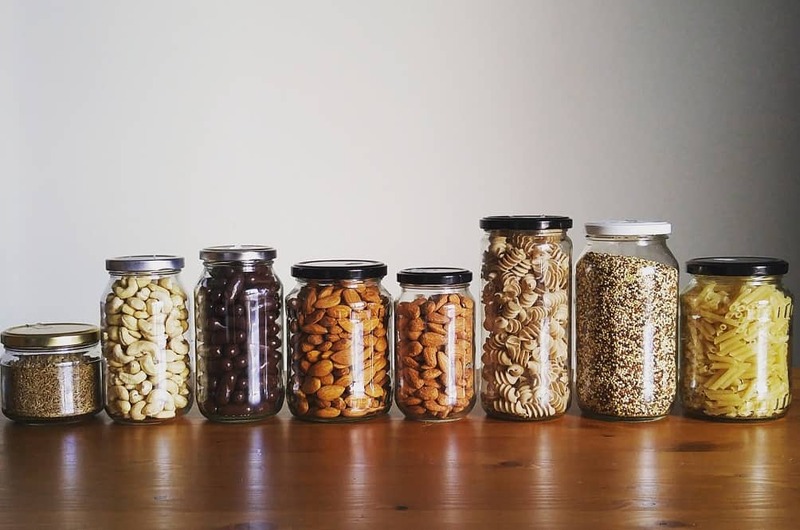 Being selective has helped me stick to a budget: certain nuts or dried fruit, for example, are soooo tasty but do I really need to buy them, in bulk or otherwise? Welfare standards and access to organics are so much higher in the UK. Here cage eggs are still legal, and supermarkets don’t stock organic eggs. I found a local store once that had organic eggs but from Queensland. Look on a map to see how far that is! Great points! Ignoring the alternatives, to the point of not even going to the supermarket, has worked great for me. I try to take comfort in the knowledge that replacing cheap, processed luxuries with more expensive whole foods helps not just my body but the earth as well! And to be honest, I don’t miss the experience of shopping at a supermarket at ALL. Fluorescent lights, endless aisles, despondent cashiers—no thanks! A trip to the local health food market is way better for my mental health. Yes! The lighting in grocery stores is so harsh. That’s one reason I avoid going in. Thank you! Yes, definitely…what you don’t know about you can’t miss, regret, or want! I agree. The question shouldn’t be “why is stuff so expensive”, it should be “why is the other stuff so cheap.” Someone or something is being exploited somewhere along the line – whether it’s the soil, the waterways, the animals, the farmers, the shop workers. Cheapness always has hidden costs. I’m the same! I have no idea what I used to buy in there, nor how I used to spend so much time in there. If you gave me a trolley and a voucher and said “buy whatever you want” I think I’d pick up a few bars of chocolate, maybe some avocados, and I’d be done! Loved your thoughts, thanks for sharing! Wishing you all the best with your transition. Slow and steady. Lindsay’s articles and peoples’ comments are quite encouraging and motivating. Local FB groups can also be quite helpful if you can find one in your general area. Focus on your ‘why’ and your little wins. I love your thoughts on this! Our ideas around what are “luxury” products and what are staples have certainly changed. I think many people expect to be able to buy everything they want all the time, and so in many cases the quality (or growing or working conditions) are compromised. We’ve lost touch with where our food comes from. 1. Some expensive things are ridiculously cheap and easy to make yourself – apple cyder vinegar, vanilla extracts are no brainers that investments are tiny or none. These two are not even time or effort consuming! Unlike homemade pasta or spaghetti sauce, but even that you can make if cutting down expenses is a motivation. It will also come out healthier too. 2. See if you can go back to natural exchange :) if you have made 2 liters of vanilla extract or tons of tomato sauce ask if your chicken farmer will want to trade it for some eggs or meat. Swapping with others is great, too. I recently donated some glass jars I’d found heading for landfill to a lady, and she brought me a lovely big bag of lemons in return. Win! Trading stray glass jars for lemons sounds like a steal :) Loved it! Not something I have tried yet, as I live a distance from my friends, is buying things like rice in bulk. I find I make so much from scratch at home (pasta, pastry, crackers, cakes & biscuits) to avoid the packaging, that I am buying flour nearly every week! If I could buy a large sack it might save me some hassle, but then I’ve got to make sure it is stored so it doesn’t get spoiled. I would like to buy a sack and split it with friends, but then I have to get it to them. I think rice can be purchased a lot cheaper in a sack than in smaller packets wrapped in plastic. This is definitely going to be my dilemma. My grocery budget (here in Australia) is $40 a week and that’s got to cover toiletries and everything. I’ve been in and out of the slow movement for years now so I have thankfully built up a supply of things like castille soap and I can make a lot of my own products, but food is where the frustrating expense is. I’m vegan as well which on the one hand makes it easier because I just need to go plant based, but there’s some tricky areas like tofu and soy milk. There’s no getting around them being in plastic…hmmmm. I’m not deterred. Cop out! Hehe ;) Oh, I’ve been there. I used to struggle between buying Green&Blacks 85% chocolate (organic, Fair Trade, but for some reason $8 from my local convenience store) and Lindt, which is always $2. In the end I had to tell myself chocolate is a treat. I could go without. If I refuse to go without, I need to do the right thing. That isn’t to say it was a struggle! And a long struggle, too. Fortunately I’ve got much better with practice. I discussed this price issue / choices with the manager of our local bulk shop and said I would prefer to shop with them & they were proactive in setting up a discount for me. I feel so appreciative that they kinda stepped up to the dilemma. As opposed to the supermarket they chat, help me with filling & packing, swap recipes and make shopping enjoyable. The issue is that by being more expensive it’s a privilege for the few. If you’re on a low income this lifestyle is out of reach, despite the savings from buying less other stuff or buying second hand. After bills, food is often the biggest expense and many people can’t afford to spend 2 x more let alone 10 x. Many people with families can’t go out of their way to go to a bulk store that is more expensive. I like the idea that if you can afford it, then do it, so that demand grows, but until a lifestyle is cheaper and easier, it won’t have mass updake. I see those of us striving for zero waste (or less waste) as pioneers and slowly things will change and hopefully widely making a more sustainable lifestyle widely accessible. My biggest struggle is when red capsicums are in season and are so cheap wrapped on a tray, and so expensive package free. I don’t think it’s acceptable to spend more on food or go without. Asking people to “remember their values” instead of purchasing something that nourishes them is unfair. It would be far better to contact the store and the supplier, and point out the difference in prices and demand for change. Unfortunately, some types of packaging simply are more expensive to produce but others are just corner cutting exercises with manufacturers. I’m fortunate enough that I have a bulk store close enough to me, a local market, and supermarkets where I can pick up produce in low waste packaging that’s cheaper. Anyone who doesn’t have this option can use their voice to demand change. Hi Sophie, thank you so much for sharing your thoughts :) I’m definitely not saying that people shouldn’t buy food that nourishes them, and if you thought that was what I was saying in my post, that is not the case. I’m just trying to help those people sitting on the fence or feeling torn, as I used to, about whether they should spend a couple of extra dollars on something or not, by sharing my own experiences. I think food is important and something I am personally happy to spend a little more on. I would never advocate going without, and if you read any of my posts you’ll know that I always talk about all of us doing whatever we can: however small that might be, it still makes a difference. I hope that makes sense! I just don’t understand why bulk soap should be 7 times as expensive as regular soap. I’m so for less waste but ignoring the fact that the price fluctuation is that big doesn’t make me feel any better.